385 in stock Need More ? This is William Shakespeare's full and unabridged play in comic book form. 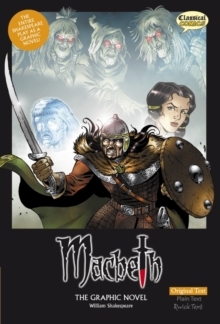 This full colour graphic novel presents "The Scottish Play" just as Shakespeare intended: in its original and unabridged format. Ideal for purists, students and readers who will appreciate the unaltered text. "Macbeth" is probably the most dramatic of Shakespeare's tragedies and this version will give you a brand new and totally fulfilling view of the sheer genius of Shakespeare's story telling. Witchcraft, superstition, murder - it's all here! Featuring stunning artwork, and full of action, atmosphere and intrigue from start to finish; this new treatment of The Bard's wonderful tragedy will have you on the edge of your seat. It's 11th century Scotland. Macbeth, Thane of Glamis, is one of King Duncan's greatest war captains. Upon returning from a battle with the rebellious Thane of Cawdor, Macbeth and Banquo encounter three witches, who prophecy that Macbeth will become Thane of Cawdor and then King. They also prophecy that Banquo will become the father of kings. When Lady Macbeth hears this, she is determined to push her husband to take fate into his own hands and make himself king by murdering Duncan. Macbeth is reluctant to harm Duncan. But, when the King makes arrangements to visit Macbeth's castle, the opportunity presents itself. Pressed on by his wife, Macbeth kills Duncan and blames the King's drunken attendants, who he also kills. However, Macbeth is racked with guilt and begins to see apparitions. When the body is discovered, Malcolm and Donalbain, the King's sons, are suspicious of Macbeth and flee for their lives. To everyone else, it looks as if the sons have been the chief conspirators and Macbeth is crowned King of Scotland. Banquo's suspicions grow, based on his encounter with the witches and Macbeth is wary of the second prophecy concerning Banquoa's offspring. Macbeth hires assassins to kill Banquo and his son, Fleance. Banquo is murdered that night, but Fleance escapes. The bloody ghost of Banquo appears to Macbeth at a feast, tormenting his already guilty conscience. In addition, Macduff, once a comrade of Macbeth, has fled after the King's sons to England, as he also suspects Macbeth. In revenge, Macbeth butchers Macduff's entire household. Macduff and the King's sons raise an army in England and march against Macbeth, who is given another prophecy by the witches, as he prepares for the assault. They tell him his throne is safe until Birnam Wood comes to Dunsinane and he will not die by the hand of any man born of a woman. Macbeth now feels invincible. Lady Macbeth, on the other hand, has been slowly driven mad by her dreams, in the wake of Duncan's murder. She sleepwalks and eventually kills herself. Macbeth learns that many of his lords are deserting and joining Malcolm's army, which approaches Dunsinane under cover of boughs, which they've cut from the trees of Birnam Wood. Macbeth and Macduff eventually meet on the bloody battlefield. Macbeth laughs derisively, relating the witches' prophecy. But Macduff retorts that he was from his mother's womb untimely ripp'd and not (technically) of woman born.